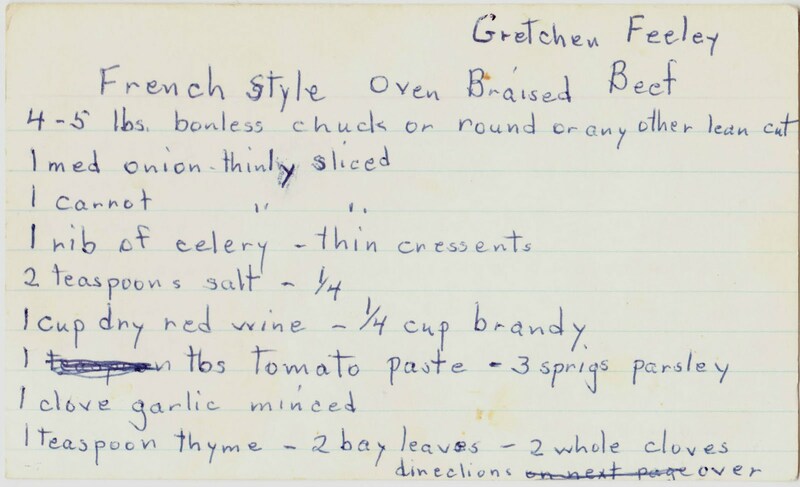 Papergreat: Found recipes, Part 2: Whose box (and turketti recipe) was this? Found recipes, Part 2: Whose box (and turketti recipe) was this? Yesterday's post about the abandoned box of family recipes prompted some spirited comments from readers. So I've done some more research, in hopes of pinpointing who the former owner was. And, as a bonus, you'll find a turketti recipe at the bottom of today's post. Gena Philibert-Ortega wrote: "Thanks so much for sharing this. Recipes are so important to a family history archive. Did any of the recipes give you a clue to who the original owner was?" 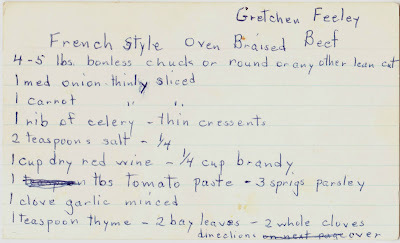 Jo Ott wrote: "My mother passed away leaving such a collection of recipes and I can assure you none will ever end up in such a sale. Gena is correct -- such collections are as important to family history as the furniture, the house, the photos left behind." 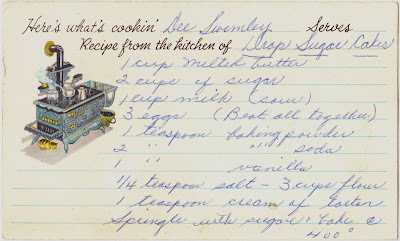 And, on a different note, Wendyvee of Wendyvee's RoadsideWonders.net wrote: "One of my favorite 'Twitter-ers' tests vintage recipes often. She also photographs her husband's reactions to her culinary experiments and he cracks me up nearly every time with his facial expressions -- http://www.midcenturymenu.com/"
Thanks, Wendyvee! That looks like a tremendously fun website. The spaghetti subs blog post is hilarious. 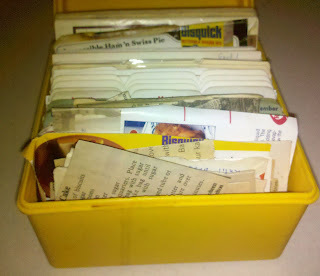 Now on to the business of determining the former owner of this plastic box of recipes. I combed through the full contents last night, and, unfortunately, I did not find a definitive answer. But some clues and possibilities have surfaced. 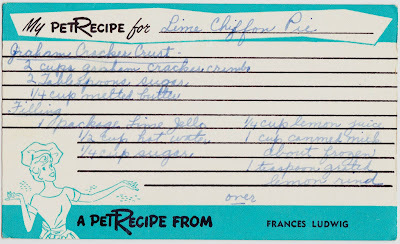 The best possibility is this PetRecipe card, which is pre-printed with the name Frances Ludwig. Some unknown company of long ago offered the customized cards. 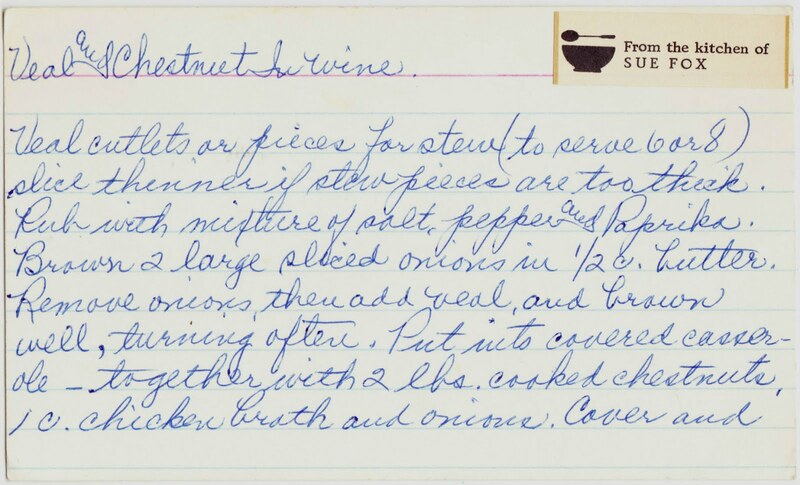 The question is: Was Frances Ludwig the owner of this recipe collection, or did Frances Ludwig give some of these cards, printed with her name, to the still-unknown owner of this collection? 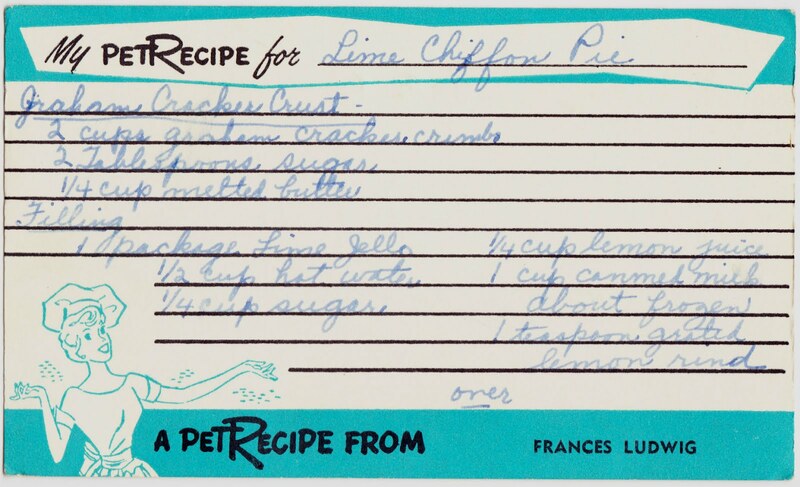 There are only two recipe cards like this in the box -- the above one for lime chiffon pie and one for cherry delight. As my wife points out, however, the style of handwriting on these two cards is not like the clean printing that appears on the majority of the recipe cards. So perhaps that's another strike against the idea of Frances Ludwig being the owner of this collection. 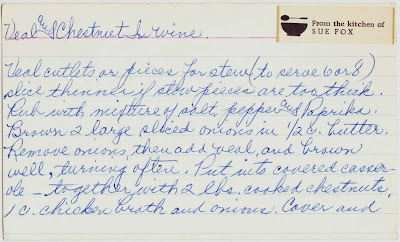 Above: Sue Fox's recipe for veal and chestnut in wine. Above: Dee Swemley's recipe for drop sugar cakes. Some of the other names that appear on recipe cards in this box are: Emilie A., B. Minker, Zenie Adamson, Connie and Mirka. Help spread this blog post around southcentral Pennsylvania and let's see if these names and scraps of information ring any bells for anyone. 1¼ cup spaghetti - 3 oz. There is definitely a reason some personal recipe cards end up in thrift stores. Turketti? That Turketti recipe belongs in the same category as Turkey a la King, Turkey Croquettes, Turkey Alfredo, Turkey Hot Dish, Turkey Divan, etc. -- that is, recipes designed to use up post-Thanksgiving leftover turkey. Its closest relative would be Turkey Tetrazzini: turkey, cooked spaghetti, flavorful sauce, cheese. Turketti is actually a pretty good recipe of its kind. 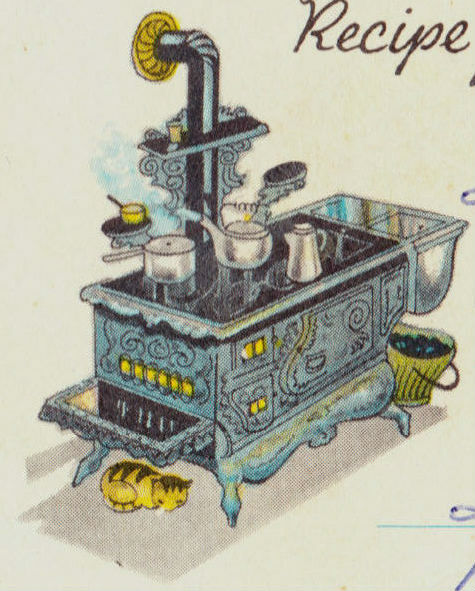 Using cream of mushroom soup as a basis for sauces was a standard maneuver back then, and the chopped ham, pimento, and green pepper would have added considerable interest. It gets extra points for specifying a sharp cheese rather than Velveeta. The only part that puzzles me is refrigerating it, then baking it for 45 minutes, which turns what would otherwise be a respectable midcentury pasta casserole into something resembling school cafeteria food. On the other hand, if the idea was to have a dish you could cut and serve in freestanding squares, that would be the way to go. In case it helps with the mystery, I picked up a nearly-full box the same stove/cat cards, all blank, in Lancaster County several years ago. Postcard: "This castle in the middle of no-where"